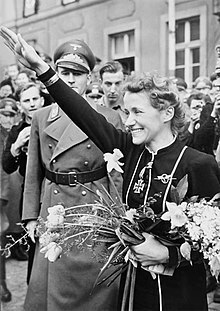 Hanna Reitsch (29 March 1912 – 24 August 1979) was a German aviatrix and test pilot. During the Nazi era, she and Melitta von Stauffenberg flight tested many of the regime's new aircraft. She set more than 40 flight altitude records and women's endurance records in gliding and unpowered flight,[better source needed] before and after World War II. In the 1960s, she was sponsored by the West German foreign office as a technical adviser in Ghana and elsewhere, and founded a gliding school in Ghana, where she worked for Kwame Nkrumah. During the last days of the war, Hitler dismissed Hermann Göring as head of the Luftwaffe and appointed Reitsch's lover, Generaloberst Robert Ritter von Greim, to replace him. 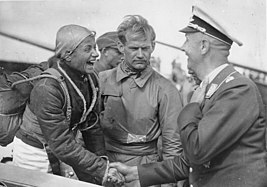 Greim and his mistress Reitsch flew from Gatow Airport into embattled Berlin to meet Hitler in the Führerbunker, arriving on 26 April as the Red Army troops were already in the central area of Berlin. :205–210 Reitsch landed on an improvised airstrip in the Tiergarten near the Brandenburg Gate. :206 Hitler gave Reitsch two capsules of poison for herself and von Greim. :211 She accepted the capsule. During the evening of 28 April, Reitsch flew von Greim out of Berlin in an Arado Ar 96 from the same improvised airstrip. This was the last plane out of Berlin. :203,213 Von Greim was ordered to get the Luftwaffe to attack the Soviet forces that had just reached Potsdamer Platz and to make sure Heinrich Himmler was punished for his treachery in making unauthorised contact with the Western Allies so as to surrender. Troops of the Soviet 3rd Shock Army, which was fighting its way through the Tiergarten from the north, tried to shoot the plane down fearing that Hitler was escaping in the plane, but it took off successfully. Reitsch was soon captured along with von Greim and the two were interviewed together by U.S. military intelligence officers. When asked about being ordered to leave the Führerbunker on 28 April 1945, Reitsch and von Greim reportedly repeated the same answer: "It was the blackest day when we could not die at our Führer's side." Reitsch also said: "We should all kneel down in reverence and prayer before the altar of the Fatherland." When the interviewers asked what she meant by "Altar of the Fatherland" she answered, "Why, the Führer's bunker in Berlin ..." She was held for eighteen months. :219 Greim killed himself on 24 May 1945. Evacuated from Silesia ahead of the Soviet troops, Reitsch's family took refuge in Salzburg. :202 During the night of 3 May 1945, after hearing a rumour that all refugees were to be taken back to their original homes in the Soviet occupation zone, Reitsch's father shot and killed her mother and sister:215 and her sister's three children before killing himself. During the mid-1950s, Reitsch was interviewed on film and talked about her wartime flight tests of the Fa 61, Me 262, and Me 163. From 1962 to 1966, she lived in Ghana. Kwame Nkrumah invited Reitsch to Ghana after reading of her work in India. At Afienya she founded the first black African national gliding school, working closely with the government and the armed forces. The West German government supported her as technical adviser. The school was commanded by JES de Graft-Hayford, with gliders such as the double-seated Schleicher K7, Slingsby T21, and a Bergfalk, along with a single-seated Schleicher K8. She gained the Diamond Badge in 1970. The project was evidently of great importance to Nkrumah and has been interpreted as part of a "modernist" development ideology. Reitsch's attitudes to race underwent a change. "Earlier in my life, it would never have occurred to me to treat a black person as a friend or partner ..." She now experienced guilt at her earlier "presumptuousness and arrogance". She became close to Nkrumah. The details of their relationship are now unclear due to the destruction of documents, but some surviving letters are intimate in tone. In Ghana, some Africans were disturbed by the prominence of a person with Reitsch's past, but Shirley Graham Du Bois, a noted African-American writer who had emigrated to Ghana and was friendly towards Reitsch, agreed with Nkrumah that Reitsch was extremely naive politically. Contemporary Ghanaian press reports seem to show a lack of interest in her past. Throughout the 1970s, Reitsch broke gliding records in many categories, including the "Women's Out and Return World Record" twice, once in 1976 [715 km (444 mi)] and again, in 1979, [802 km (498 mi)] flying along the Appalachian Ridges in the United States. During this time, she also finished first in the women's section of the first world helicopter championships. And what have we now in Germany? A country of bankers and car-makers. Even our great army has gone soft. Soldiers wear beards and question orders. I am not ashamed to say I believed in National Socialism. I still wear the Iron Cross with diamonds Hitler gave me. But today in all of Germany you can't find a single person who voted Adolf Hitler into power ... Many Germans feel guilty about the war. But they don't explain the real guilt we share – that we lost. I asked Herman Goering one day, "What is this I am hearing that Germany is killing Jews?" Reitsch died of a heart attack in Frankfurt at the age of 67, on 24 August 1979. She had never married. Former British test pilot and Royal Navy officer Eric Brown said he received a letter from Reitsch in early August 1979 in which she said, "It began in the bunker, there it shall end." Within weeks she was dead. 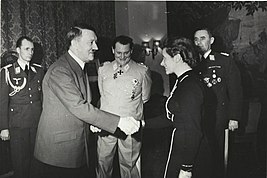 Brown speculated that Reitsch had taken the cyanide capsule Hitler had given her in the bunker, and that she had taken it as part of a suicide pact with Greim. No autopsy was performed, or at least no such report is available. 1939: women's world record in gliding for point-to-point flight. 1943: While in the Luftwaffe, the first woman to pilot a rocket plane (Messerschmitt Me 163). She survived a disastrous crash though with severe injuries and because of this she became the first of three German women to receive the Iron Cross First Class. Ich flog in Afrika für Nkrumahs Ghana. 2nd ed. Munich: Herbig, 1979. ISBN 3-7766-0929-X (original title: Ich flog für Kwame Nkrumah). Das Unzerstörbare in meinem Leben. 7th ed. Munich: Herbig, 1992. ISBN 3-7766-0975-3. Höhen und Tiefen. 1945 bis zur Gegenwart. Munich: Heyne, 1984. ISBN 3-453-01963-6. Höhen und Tiefen. 1945 bis zur Gegenwart. 2nd expanded ed. Munich/Berlin: Herbig, 1978. ISBN 3-7766-0890-0. Reitsch has been portrayed by the following actresses in film and television productions. Diane Cilento in the 1973 British film Hitler: The Last Ten Days. Myvanwy Jenn in the 1973 British television production The Death of Adolf Hitler. Anna Thalbach in the 2004 German film Downfall (German: 'Der Untergang). Rieger, Bernhard. "Hanna Reitsch (1912–1979): The Global Career of a Nazi Celebrity." German History 26.3 (2008): 383-405. ^ "Hanna Reitsch – Hitlers Fliegerin". ORF. Retrieved 24 August 2017. ^ Bernhard Rieger, "Hanna Reitsch (1912–1979): The Global Career of a Nazi Celebrity." German History 26.3 (2008): 383–405. ^ a b c d e f g h i j k l m n o p q r s t u v w x y z aa ab ac ad ae af ag ah ai aj ak al Reitsch, Hanna (2009). The Sky My Kingdom: Memoirs of the Famous German World War II Test Pilot. Drexel Hill, Pennsylvania: Casemate Publishers. ^ Shirer, William L., The Rise and Fall of the Third Reich: A History of Nazi Germany, New York: Simon and Schuster, 1960, ISBN 978-0-671-62420-0, p. 1454. ^ "Hitler's Woman Pilot Seized". New York Times. 10 October 1945. Retrieved 7 July 2008. The question whether Adolf Hitler is dead or alive may be answered by the testimony of Hanna Reitsch, woman Luftwaffe pilot, who was in a Berlin bomb shelter with him a few hours before the Russians captured it. She was arrested in the United States zone of occupation today and is being interrogated. ^ Hans Dollinger with Hans Adolf Jacobsen, tr. Arnold Pomerans, The Decline and Fall of Nazi Germany and Imperial Japan: A Pictorial History of the Final Days of World War II, New York: Crown, , OCLC 712594, p. 234. ^ Jean Allman (February 2013). "Phantoms of the Archive: Kwame Nkrumah, a Nazi Pilot named Hanna, and the Contingencies of Postcolonial History-Writing". American Historical Review. 118 (1): 108. doi:10.1093/ahr/118.1.104. ^ Afua Hirsch (16 April 2012). "Hitler's pilot helped Ghana's women to fly". The Guardian. Retrieved 16 April 2012. ^ Slater, AE (December 1979 – January 1980). "Obituary". Sailplane & Gliding. British Gliding Association. 30 (6): 302. ^ Shirley Graham Du Bois to Nkrumah, 28 June 1965, box 3 file 57, Nkrumah Papers, quoted in Allman, "Phantoms of the Archive: Kwame Nkrumah, a Nazi Pilot named Hanna, and the Contingencies of Postcolonial History-Writing", American Historical Review, vol. 118 no. 1 (Feb. 2013) p. 122. ^ Allman, "Phantoms of the Archive: Kwame Nkrumah, a Nazi Pilot named Hanna, and the Contingencies of Postcolonial History-Writing", American Historical Review, vol. 118 no. 1 (Feb. 2013) pp. 104–5. ^ Ron Laytner, "The first astronaut: tiny, daring Hanna", The Deseret News 19 February 1981, pp. C1+, p. 12C. ^ "Hanna Reitsch, 67. A Top German Pilot. Much-Decorated Favorite of Hitler Was Last to Fly Out of Berlin Was Cleared by U.S. Hitler Gave Her Iron Cross in Voluntary Suicide Squad". New York Times. 31 August 1979. Retrieved 7 July 2008. Hanna Reitsch, the leading German female pilot and a much-decorated favorite of Hitler who flew the last plane out of Berlin hours before the city fell in 1945, died Friday at her home in Bonn, West Germany. She was 67 years old. ^ "Hanna Reitsch, Test Pilot for Hitler". Washington Post. 1 September 1974. Retrieved 7 July 2008. Aviation pioneer Hanna Reitsch, 67, who flew the last plane out of burning Berlin before the fall of the Nazis in 1945, died Aug. 24, the West Germany radio has reported. ^ "Hitler: The Last Ten Days (1973)". IMDb.com. Retrieved 8 May 2008. ^ "The Death of Adolf Hitler (1973) (TV)". IMDb.com. Retrieved 8 May 2008. ^ "Untergang, Der (2004)". IMDb.com. Retrieved 8 May 2008. The last interview on YouTube where she exclaims about Hitler's understanding in avionics: "I was deeply astonished about his interests"
This page is based on the Wikipedia article Hanna Reitsch; it is used under the Creative Commons Attribution-ShareAlike 3.0 Unported License (CC-BY-SA). You may redistribute it, verbatim or modified, providing that you comply with the terms of the CC-BY-SA.